In celebration of Thanksgiving, I give you our annual Turkey Torts of a few potential and actual lawsuits from this holiday. Putting aside the regular murders occurring on this holiday by family members, the holiday continues to be replete with torts from deep-fried Turkeys to salmonella salads. The holiday gives personal injury lawyers a great deal to be thankful for. We have the usual array of Thanksgiving burn cases that overwhelmingly involve deep-fried turkeys. One such case Serafino Alfe, 30, outside of Chicago who described his accident as a case where “I basically fried myself” when he was frying a turkey for an annual fundraiser and tripped right into the deep fryer. No lawsuit have been filed in such cases where negligence only injures the negligent party. Also from my home town last year was the hospitalization of 7 people in a Thanksgiving dinner. The host used a charcoal grill inside the home and served up heaping helpings of carbon monoxide poisoning. Twenty people reported feeling sick. The case remains within the statute of limitations, but a negligence action would appear an obvious possibility (even with plaintiffs’ conduct). One fairly straightforward tort and criminal case from 2011 is from Omaha, Nebraska where Cindy Kellogg, a grandmother making Thanksgiving dinner, was shot in the arm. The man, however, can defend himself that this was accidental . . . he was aiming at the fleeing children. Her 14-year-old grandson fell fleeing the man who starting shooting at playing children for no apparent reason. Incredibly, however, there is still no record of an arrest of the man. Brian and Christa Caponi of Gulf Breeze Florida have a potential tort claim against their Panhandle, Florida neighbor who (with a friend) used a bow and arrow to kill their pet Turkey. While the Caponi’s have 50 dogs, cats, chickens, and other animals, “Tom the Turkey” was like a dog to their family. The two arrested teens said that they saw a 30-pound Thanksgiving dinner rather than a pet. They have been charged with armed burglary, armed trespassing, theft of livestock and animal cruelty. As we have discussed, these cases are difficult in torts because such pets are valued at their replacement costs rather than their sentimental value. To capture the pain and suffering in such acts, plaintiffs will often proceed on negligent or intentional infliction of emotional distress claims. A Texas court is looking into whether copying Turkey cooking instructions is a copyright violation. Our turkeys arrive at your door ready to eat. Refrigerate immediately. The turkey will keep in the refrigerator for 6-8 days. If you do not plan to use it in that length of time, it should be frozen. We recommend that our turkeys are eaten chilled or at room temperature — just slice and enjoy! If heating is required, follow these instructions: place turkey in a Reynolds® Oven Bag, which can be bought at your local grocer. Do not add flour to the bag. Cut 6 to 7 small slits in the top of the bag. Heat at 300 degrees for 6 minutes per pound. That is some pretty generic information to be placed under copyright protection, in my view. In Florida, a major tort action has been filed two years after a massacre at a Thanksgiving dinner where a six-year-old South Florida girl and three others were killed. The lawsuit alleges that Michael and Carole Merhige were negligent because they knew their son was planning to attend the Thanksgiving event, even though he was unstable and uninvited. It was filed by Muriel and Jim Sitton, and Antoine Joseph, whose wife was killed by Paul Merhige. The complaint alleges that his parents were aware of his violent propensity and did nothing to warn them that he would be attending their Thanksgiving dinner in 2009. It includes an alleged statement by his mother to her daughter that she hoped her son wouldn’t “come and kill us all” in advance of Thanksgiving. There is also an intriguing claim that since Paul Merhige’s father was a former CIA agent and he had particular skills and training to prevent the massacre. The case resembles the famous 1976 ruling in Tarasoff v. Regents of the University of California. and the imposition of liability on a university. See Tarasoff opinion. In that case, Prosinjit Podder, a graduate student at Berkeley, fell in love with Tatiana Tarasoff. When she stated that she wanted to date other men, Podder went to counseling at the University Health Service and is treated by psychologist, Dr. Lawrence Moore. When he told Moore that he wanted to get a gun and kill Tarasoff, Moore sent a letter to campus police who interviewed Podder and decided that he was not a risk. Podder then went ahead and murdered Tarasoff. Podder was found legally at fault. Here the parents are being accused of failing to warn or act in light of Merhige’s history of emotion and mental problems. Adding to the alleged failure was the careful planning of their son who acquired 4 guns and ammunition, taking $12 thousand out of the bank, and buying a cover for his car that he used to hide it. Our winners for the worst Thanksgiving celebration last year was the dinner held at the Georgia home of Patty Jo Marsh and her husband, who decided that the best activity after Thanksgiving dinner was to give their seven children tattoos using a home-made tattoo device. The parents borrowed a tattoo machine from a friend and used a needle made from guitar strings to give six of their seven children tattoos after Thanksgiving. The children range in age from 10-17. The ten year old was spared the experience. The tattoos were spotted by their biological mother when they returned home (much like the earlier Fresno case). She was not pleased and called child welfare. In Georgia, it is illegal to give tattoos to children under 18 and it is illegal to give tattoos to anyone without a license. The couple insists that they did not know it was illegal and only gave into the demands of the kids that they wanted small cross tattoos like their own. They have been charged with cruelty to children, reckless conduct and tattooing without a license. They also could face a lawsuit from the biological mother since the children were too young to consent to tattoos and such tattooing of children is legal in most states. Absent legally recognized consent (as opposed to actual but invalid consent of a minor) the parents can be charged with battery. They cannot use substituted consent in such a circumstance for their children in most states. A tort action in Chicago presents a somewhat novel dispute over the proper way to eat a sandwich. Mackenzie Seiler went to Jimmy John’s restaurant for a Turkey Tom sandwich. He went into anaphylactic shock after he bite into the sandwich, which turned out to be tuna and filled with cheese and mayonnaise. A person with severe allergies, he had specifically told them to hold the cheese and mayo — let alone the tuna. However, the restaurant says it was his fault for failing to properly unwrap the sandwich before biting into it. He is now seeking more than $50,000 from Jimmy John’s after going into shock. Jimmy John’s says that his eating habits are contributory negligence and that he is responsible for his three days in the hospital. The restaurant insists that a reasonable person removes the sandwich from its wrapping, inspects it, and only then bites into it. (I also tend to weigh the sandwich on an atomic scale to confirm proper weigh and measure the sandwich to guarantee that it is properly proportioned . . . but that is just me). Once again, I do not get why the restaurant wants to fight this one. How many jurors does the restaurant think actually unwrap a sandwich completely and do an inspection before chomping down? This fight occurred because the restaurant refused to pay his hospital costs. I am particularly interested in the experts that will be called by either side in this dispute. The EU must have a rule on this. Of course, there may be some raw regionalism in the case with the restaurant accusing Seiler of eating “like a New Yorker.” I would suggest the sandwich truck guys and the guys at the Billy Goat Grill as obvious choices for experts on sandwich tactics and customs. Of course, as shown in the case of TJ Hooper, industry custom is not always controlling, so the court could articulate a new standard for sandwich consumption. Thanksgiving holidays are notorious for bringing out family stress and divisions, but know family does it quite like the Smiths of Hudson, Florida who ended up having Thanksgiving in jail over a disagreement involving the proper way to stuff a Turkey. Along the way the committed a variety of torts and crimes. Elizabeth Smith, 21, was shocked when she woke up at 7 a.m. on Thanksgiving Day to stuff her turkey — only to find that her father-in-law Donald “Junior” Smith, 49, had beat her to it. It was not how she wanted it stuffed and, to make matters worse, he used celery which her husband Tristan Smith, 21, is allergic to. A shouting match erupted. Junior blamed Elizabeth as incompetent and said that no one was helping him cook. Elizabeth said that she wanted to cook but no one woke her. Tristan intervened in defense of his wife. It soon turned physical as the men rolled around the house and ended up in the room of Tristan’s 3-year-old son and 5-month-old daughter. Then Tristan’s mom, Joan Ethel Brewster, 54, grabbed Elizabeth by the hair and scratched her — pulling her hair out and causing bleeding on her face. Joan called the police and she and Junior were arrested and booked . . . wait for it . . . at the Land O’Lakes Jail. They were held for Thanksgiving and had dinner in jail — presumably properly prepared by others. The result was both criminal and tort helpings of assault and battery. Last year, we also had a curious product liability and negligence allegation. When Lisa Blair’s mother, Jean Kasper, died, she wanted to carry part of her mother with her. She consulted with a funeral home on the use of heart-shaped lockets for carrying the ashes. She filled identical lockets for her seven daughters and stepdaughters. She alleges that she dropped off the lockets to be sealed and tested by the funeral home. At Thanksgiving dinner, Blair noticed that the mashed potatoes had small flecks in them, but continued to eat. After consuming most of the potatoes, she looked down and realize that her mother’s ashes had fallen into the mashed potatoes and that she had consumed them. She also discovered that the lockets on her daughters and stepdaughters had also leaked into their food. Cresmount funeral home will not discuss the allegations. Blair could allege an assortment of torts from negligence to negligent infliction of emotional distress. If the funeral home represented that the lockets were sealed, it might be able to survive a motion to dismiss. There is also the possibility of a products claim. However, these lockets were not made for this purchase and this is not likely a case for foreseeable misuse against the manufacturer. The niece sued her uncle and aunt. The question was Erica’s status as trespasser or an invitee. The case also explored the meaning of an attractive nuisance. In this case, it is undisputed that Erica was invited over for Thanksgiving dinner and that she did not obtain permission from appellees or any other adult to exit the house or visit the horse penned in the paddock. Moreover, it is uncontested that Erica was never permitted by appellees to roam freely in “any part of the subject property without both parental supervision and permission.” Upon a thorough review of the record, and finding no genuine issues of material fact, we find that Erica was only invited to appellees’ home for Thanksgiving dinner and was not invited to freely explore the property. Accordingly, we find that once Erica left the house and entered the horse paddock area, she exceeded the scope of appellees’ invitation and became a trespasser or a licensee on appellees’ property. Normally, a landowner would only owe a trespasser or licensee the duty to refrain from wanton, willful or reckless conduct which is likely to injure the licensee or trespasser. . . .However, the Ohio Supreme Court has held that the amount of care required of a landowner to discharge a duty owed to a child of tender years, who is exposed to danger on the landowner’s property, is greater than that required to discharge a duty to an adult exposed to the same danger. Di Gildo v. Caponi (1969), 18 Ohio St. 2d 125, 47 Ohio Op. 2d 282, 247 N.E.2d 732, paragraph one of the syllabus; and Bennett v. Stanley (2001), 92 Ohio St.3d 35, 39, 2001 Ohio 128, 748 N.E.2d 41. The rationale for this rule is that HN7″‘Children of tender years, and youthful persons generally, are entitled to a degree of care proportioned to their inability to foresee and avoid the perils that they may encounter ***. The same discernment and foresight in discovering defects and dangers cannot be reasonably expected of them, that older and experienced persons habitually employ; and therefore, the greater precaution should be taken, where children are exposed to them. '” Di Gildo at 127, citing 39 Ohio Jurisprudence 2d 512, Negligence, Section 21. “Even child trespassers are accorded special protection in Ohio tort law.” Bennett, 92 Ohio St.3d at 40. In determining a landowner’s duty to a child, Bennett held that “whether an apparatus or a condition of property is involved, the key element should be whether there is a foreseeable, ‘unreasonable risk of death or serious bodily harm to *** children. '” Id. at 42, citing Restatement, Section 339(b). However, “even when a landowner is found to have an attractive nuisance on his or her land, the landowner is left merely with the burden of acting with ordinary care” and “does not automatically become liable for any injury a child trespasser may suffer on that land.” Id.
. . . Appellant argues that appellees’ horse created an attractive nuisance and, as such, appellees owed Erica the duty of ordinary care. We, however, find no authority in Ohio law which establishes that an animal is “an artificial condition” which invokes the doctrine of attractive nuisance. Accordingly, we find that the attractive nuisance doctrine is not applicable in this case. Nevertheless, based upon the holdings and rationale in Bennett and Di Gildo, we find that “children of tender years, and youthful persons” are generally entitled to a degree of care commensurate with their inability to foresee and avoid dangers, even when trespassing. In considering whether appellees breached their duty to Erica, we must first consider whether it was foreseeable to appellees that Erica would trespass into the horse paddock area while on their property. Appellant argues that it was foreseeable that Erica, a child guest at Thanksgiving dinner, would wander out to the horse paddock. We, however, find that the undisputed evidence is to the contrary. First, neither on the day in question, nor during earlier visits, was Erica ever given unfettered access to appellees’ property; rather, permission and adult supervision was required. Second, at no time was any child guest allowed “to roam freely around the subject property or enter the area in or around the horse paddock area.” Third, according to Mr. Castor, on previous visits to the property, Erica “never unilaterally left the house or entered the area in or around the horse paddock area.” Fourth, the horse was enclosed with an electrified wire fence, which, according to Erica, she was warned to avoid. Based on these undisputed facts, we find that it was not foreseeable to appellees that Erica would trespass upon their property into the area of the horse paddock. Assuming arguendo that a genuine issue of material fact exists regarding whether it was foreseeable to appellees that Erica would trespass into the horse paddock, we note that the degree of care owed by appellees only would have to be proportionate to Erica’s inability to foresee and avoid the perils that she may encounter and, in no event, would appellees’ duty to Erica extend to dangerous conditions that were obvious and realized by her. See Bennett, supra at 43. Appellant, however, argues that appellees should have warned Erica and her parents regarding this horse’s history of aggressive behavior toward a sheep that entered its enclosure. However, based on Erica’s own testimony, we find that she knew horses presented a risk, that she was not to go near the electric fence, and that an adult was supposed to accompany her around horses. Accordingly, we find that the potential danger any horse posed to Erica was both known and obvious to her. We therefore find that appellees owed no duty to Erica or her parents to provide additional warnings regarding this horse in particular. Based on the foregoing, we find that there are no genuine issues of material fact and that appellees are entitled to summary judgment as a matter of law. Erica was a trespasser on appellees’ property and, therefore, appellees were only required to refrain from willful, wanton and reckless conduct. However, to the extent that Erica’s age would entitle her to a greater degree of care than that normally afforded a trespasser, we find that appellees breached no duty to Erica insofar as she fully realized the obvious risk that horses presented, and proceeded at her own peril. Accordingly, we find appellant’s first and second assignments of error not well-taken. On consideration whereof, the court finds substantial justice has been done the party complaining and the judgment of the Williams County Court of Common Pleas is affirmed. Appellant is ordered to pay the court costs of this appeal. On November 16, 1998, Plaintiff [*2] Crystal Dennis (“Crystal”) and her thirteen-month-old son, Velvin Morgan, Jr. (“Velvin”)(collectively, the “Plaintiffs”) went to the home of Mr. Dennis, who is Crystal’s father and Velvin’s grandfather. Defendant Stephanie Dennis (“Stephanie”), who is Crystal’s sister, was also present at her father’s home. The sisters had gathered at Mr. Dennis’s residence in order to clean it for Thanksgiving dinner. While the daughters were cleaning, Mr. Dennis babysat Velvin. While all three adults and Velvin were in the kitchen prior to eating breakfast, Stephanie warmed water in the microwave for hot tea. She took the cup out of the microwave and placed it on the counter. Velvin, who was sitting on his grandfather’s lap, got up and walked over to the counter, reached up and poured the scolding water on himself. As a result, he sustained first and second degree burns on his neck and chest. The Plaintiffs filed suit against Mr. Dennis and Stephanie (collectively the “Defendants”), alleging that the Defendants’ negligence was the proximate cause of Velvin’s injuries. No person who enters onto private residential or farm premises owned or occupied by another person, either as a guest without payment or as a trespasser, shall have a cause of action against the owner or occupier of such premises for any injuries or damages sustained by such person while on the premises unless such accident was intentional on the part of the owner or occupier or was caused [*4] by the wilful or wanton disregard of the rights of others. Outcome: The Court was not convinced and found the lawsuit against the father to be properly dismissed. The underlying facts show that on Tuesday, February 6, 1968, Pearl Samson attended a luncheon, which was put on by the Wauwatosa High School Band Mothers Association (an organization organized to give support to the high school band) at the Wauwatosa Trinity Episcopal Church. Pearl Samson paid $ 1.25 and ate a luncheon consisting of turkey salad and dessert. On Wednesday evening she became nauseated. She was unable to work on Thursday and Friday. The symptoms subsided, and she returned to work on Monday, February 12th. A few days later, however, she again was obliged to miss work because of her illness. After these symptoms recurred every few days, she visited her doctor, who was unable to help her, and in the nine-month period following the luncheon she lost 22 pounds and periodically suffered from diarrhea, vomiting, cramps, and stomach pain. Eventually she was referred to a specialist, who determined that Pearl Samson’s condition was the result of salmonella food poisoning and that, as a consequence, she suffered a deficiency of the lactase enzyme in her intestinal tract. This enzyme is necessary to properly digest foods with a lactose base, such as milk and dairy products. She claims that her illness recurs whenever she ingests foods which contain milk products. There was testimony that she found it impossible to be sure that the food she ate contained no such products and that she became severely ill sometimes twice a month. Her physician testified that this condition is permanent. There is evidence that the turkey salad eaten at the luncheon was contaminated with salmonella bacteria. Dorothy G. Wood, one of the defendants, testified that she had taken some of the leftover salad home for her family to eat. Her family ate some of that salad and had no ill effects. When she received reports that some of the guests at the luncheon had become ill, she notified the chief sanitarian of the Wauwatosa Health Department. He submitted the sample of the remaining salad to the Milwaukee Food Laboratory. The report from the laboratory indicated the presence of the salmonella bacteria. There was testimony by Dorothy G. Wood that she and Marjorie E. Borror were co-chairmen in charge of the luncheon, that approximately a month before the luncheon they purchased nine frozen turkeys from Kohl’s and had them stored in Kohl’s freezer until they were needed. Before the date of the luncheon, Dorothy Wood picked up the frozen turkeys and delivered them to other members of the luncheon committee. She named eight members of the committee to whom she delivered the turkeys to be cooked in their own homes. She stated that she delivered the turkeys to Margarette H. Hoffman, Charlotte G. Soleski, Violet E. Gullicksen, Betty Randa, Grace A. Kerler, Marjorie E. Borror, Ruth E. Johnson, Jane Frances, and one other. Each of these persons are defendants in the instant lawsuit. In addition, Audrey Riesing and Phillis Gill, together with Dorothy Wood, are named as defendants. Dorothy Wood stated that she did not cook a turkey, but that nine ladies, one of whom she could not name, cooked them sometime between the day she delivered the turkeys and the afternoon of February 5, 1968, when the ladies brought the cooked turkeys to the Trinity Episcopal Church kitchen. The turkey salad was prepared in the Trinity Episcopal Church kitchen. At trial, Joseph D. Gorski, the chief sanitarian for the Wauwatosa Health Department, testified that salmonella is a bacteria common to the intestinal tracts of fowl. He said that food containing salmonella bacteria can be rendered safe for eating by exposure to heat and that a meat temperature of 146 degrees Fahrenheit for thirty minutes or 161 degrees for thirty seconds would kill the organism. Properly cooking a turkey would render it free from salmonella bacteria. However, even though a turkey were properly cooked, it could be contaminated if it came in contact with utensils or other objects which touched the raw contaminated turkey. Gary V. Doern, a bacteriologist, also testified that some individuals are unknowing carriers of the salmonella bacteria and can contaminate food products by touching them.
. . . In this case nine turkeys were cooked, each by one of nine defendants, but not all of the 11 defendants cooked the turkeys. It does appear, however, that all of them participated in the preparation of the salad. The court found that first criteria satisfied but ruled that it failed on the second criteria of exclusive control. They could not prove which of the band mother’s Turkeys was the culprit so all of the band mothers walked. Turley’s Turkey Torts — one of my mom and my favorite Thanksgiving traditions! Happy Thanksgiving to you and your family! re: the guy with the allergies eating a tuna sandwich rather than turkey. He provided contributory negligence. As the one with the severe allergies, he is the one who should be checking everything he eats and not assuming that the preparer of the food has taken his allergies into account. The major negligence remains with the preparer. My potato salad usually gets a bit of mustard. My brother is allergic to horseradish. Before eating my potato salad, or anything made of many ingredients, he asks about horseradish and mustard which frequently contains horseradish. If I can’t satisfy him that my mustard doesn’t contain horseradish, he doesn’t eat the potato salad. Anyone with food allergies should be as cautious. 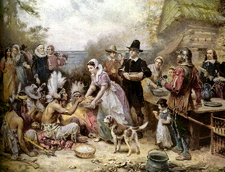 Darren, a friend of mine who is a Native American claims that the talk of the pilgrims surviving because of the kindness of strangers was a kind of Hallmark Expression and that the first Thanksgiving wasn’t “all that.” She claims that the torts were committed BY and not UPON the pilgrims. On the “I was only trying to kill the kids” defense for the grandmother who got shot in the arm in Omaha, I have gotta say this: Maybe the guy was only trying to shoot the kids in self-defense. That may be why he was not arrested. You sure this isn’t the season of the Darwin Award contenders….. I wonder what kind of torts the Pilgrims experienced during theirs. Nothing says the holidays like shooting at the children.